The uber-rich can handle the continued economic changes and still afford that beautiful Hermes bag but those of us who are scrimping to get our hands on a Kenneth Cole or BCBG bag for a pretty penny will be hit the hardest. 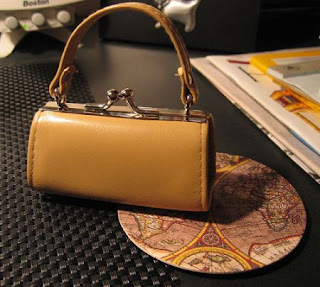 Even though the handbag scene is still expected to post a 4% gain this year, that is half the increase from 2006. Handbags from Coach to Jimmy Choo are seeing a drop in purse purchases with an over-saturated market , and the struggling retail world is to blame. Gas continues to goes up, Christmas bills have piled up, and the housing market is anything but up. guess that means a lot of us may be downsizing our accessory budgets for 2008. Posted by Beezy at Tuesday, January 08, 2008 . Measuring 14" x 9" x 5½", the nylon Skye bag is available in five colors and sells for $595. Made from Italian nylon (who knew there was such a thing? Since we aren't worried about weather on the inside of the bag, the suede lining provides our leather fix. 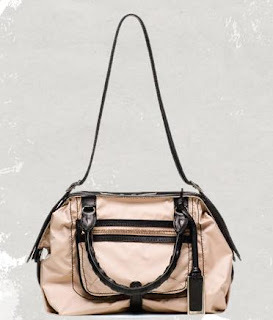 the Skye bag sports good looks and durability. Trimmed in leather with tonal topstitching, the bag features brushed silver metal hardware and a long, flat shoulder strap as well as a shorter, rolled leather handle. The last thing you want to do when the snow is flying is to break out your nice leather handbag. Snowbound fashionistas need something moisture-resistant and stylish, and this bag fits the bill. Their 16mm d20 Meteorite Dwarven Stones are, as their title suggests, twenty-sided dice made of meteorite. The six sides of each die measure in at 0.3 mm each, with 0.05 mm pips. From the gold-plated, six-sided die to the colossal, and somewhat awkward, 100-sided die, there has always been some special die for gaming enthusiasts to drool over. The second most expensive dice in the world are offered by Crystal Caste, a company specialized in dice made from precious materials. Yes, these tiny dice are the most expensive dice in the world. Each of these expensive dice is made of 0.00016 grams of brass. 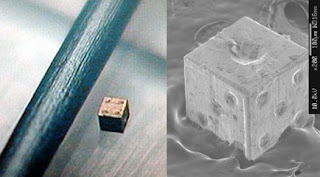 The most expensive die in the world may be ordered, with an accompanying case, through Nippon Styleif you know Japanese. Iriso Seimetsu, a Japanese company, has created exactly that. The Meteorite Dwarven Stones can be ordered for $200 through Crystal Caste's website. Even with the latest micromachine technology, these dice take nine hours each to produce. The former Spice Girl recently purchased the world's most expensive tree house from Neiman Marcus for her three children, Brooklyn, Romeo and Cruz. The most expensive in the world is an excellent investment for filthy rich persons who want to go camping without dealing with all that inconvenient nature stuff. Unfortunately, it's a limited edition, so you'll have to wait in line behind the dozens of celebrities who've already staked their claim. 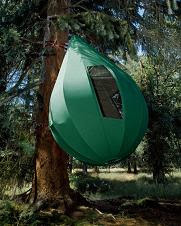 Can you imagine paying $50,000 for a tree house? The thirteen-foot tent features a nine-foot-diameter hardwood floor, a round mattress that can comfortably fit two adults and adjustable planetary landing steps. The Treetent, resembling an overgrown pear, was created by Dutch sculptor and designer Dré Wapenaar. If you're like Victoria Beckham, the answer is "Yes! 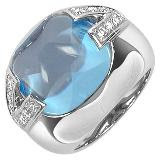 This opulent blue Topaz ring features in the Gianni Versace V-line. The dazzling ring is made in 18K white gold accented by two V's made by a pave of brilliant cut round diamonds and set with oval-shaped topaz in the middle. Accessible, understate and perfectly tailored, Versace offers a full range of clothing and accessories to fashion-conscious and discerning businessmen. Traditionally, this is the only line which is presented on the runway which is shown during Milan's fashion week, but this has not be strictly the case in recent years. The ring looks absolutely stunning and adorns a price tag of $4,545. Gianni Versace Couture, which contains high-end, often handmade apparel, jewellery, watches, fragrances, cosmetics and home furnishings, is the House's main line. The Versace Jeans Couture line combines superior design and unmatched quality. But this time they are not just in apparel but also in jewelry. Japan's Takashimaya Department Store exhibits a 200 million yen ($1.8 million) platinum handbag designed by jewelry maker Ginza Tanaka at a press preview of the "New Year Lucky Bag". The handbag is adorned with 2,182 diamonds calculating some 208 karats, including an eight karats pearl shaped diamond in its center. This is the world's most expensive Barbie doll, designed by De Beers, is dressed in an evening gown decorated with 160 diamonds and she has complimentary white gold miniature jewelry and accessories. Whilst if you think it is a too expensive deal to be done then you can eye 1959 Barbie No. This Barbie was produced to mark the 40th anniversary in 1999 comes and was retailed at $85,000. 1 carrying a price tag of $8000, according to Stew Writer. Another breathtaking piece of jewelry from the De Beers high jewelry collection, the Grey and Orange Diamond ring. De Beers is showing these unusual stones hoping they will capture enough market share to continue to keep diamonds as the luxury standard for jewelry. They will decide that smaller stones need more demand and will withhold larger stones. 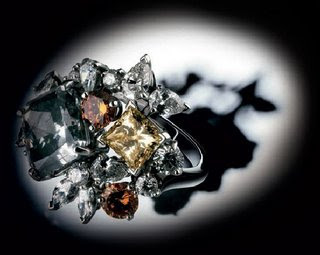 DeBeers is known for manipulating the demand for stones. The ring is a selection of fancy white and colored diamonds encrusted on a platinum band. The Grey and Orange Diamonds ring is going to elicit the most powerful yes in the world from your lady love when you get down on your knees. The total carat weight is 11.5 that is sure to batter any woman's heart. Clean and clear is mostly our dream for our Room. We can arrange our furniture, wipe our floor or carpet. Thanks to the one who invent a tool calls VACUUM CLEANER !. It will be hardly impossibe to clean our floor (especially carpet or fur). Not with our traditional way. You can argue with me, but you must admit that VACUUM CLEANER will do better to wipe this problem. I will give you one information that will change you life. Ever hear about Dyson Vacuums? That will be a great leap to achive cleanly ROOM if you use this Dyson. With various type that specified by its use, you will never miss any dirt left. Get more informations here http://wize.com/vacuums/brand!Dyson, and see what the others testimonial. Then choose the most suitable type for your need.